"OmiseGO enables financial inclusion and interoperability through the public, decentralized OMG network." The current financial system forces merchants and businesses to rely on antiquated banking systems that waste valuable time processing and tack on cumbersome transaction fees. This is largely due to the nature of these centralized systems that require compatibility across payment networks and financial institutions. While there have been reasonable steps in the right direction via payment processors like Apple Pay and Venmo, these still leave the end customer at the mercy of a network run by a centralized entity with complete control. Through the implementation of blockchain applications, sellers are opened up to a world of near zero-fee transactions, and innovative incentive systems that further drive brand loyalty and growth. While this sounds like a no-brainer for businesses in theory, integrating a blockchain payment system is a daunting task that currently has a high barrier to adoption. What’s more, most blockchain innovations currently rely on the Ethereum blockchain, which has scaling limitations. That’s why any project that is able to create, and sell, a unique blockchain payment platform that offers ease of use and extra incentive systems at scale will be a massive creator of value. One such project is OmiseGO, which aims to solve the coordination problem among payment processors, gateways and financial institutions. By enabling decentralized monetary exchange at high volume and low cost, OmiseGO is hoping to build a value transfer service operating across currencies and asset types, national borders and corporate ledgers. Through their white-label wallet software development kit (SDK) that will make it easy for businesses to create dapps, OmiseGO is building a platform designed for simple integration. Ultimately, they hope this will work to allow customers to move money quickly, gain a secure ledger for tracking assets, provide next-generation mobile banking solutions, and create loyalty points systems for a consortium of brands. 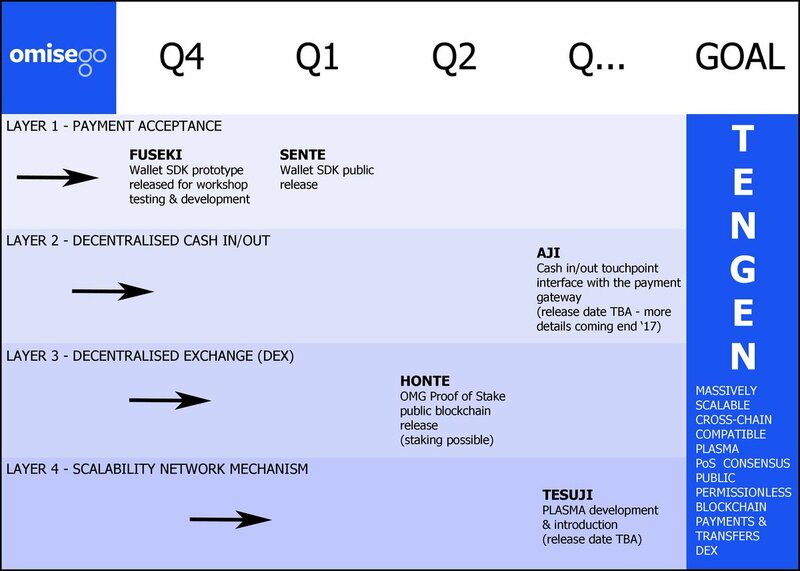 Addressing the Ethereum scaling issue head-on, OmiseGO became the first project to adopt Plasma, a proposed framework for incentivized and enforced execution of smart contracts. It is scalable to a significant number of state updates per second (potentially billions), enabling the blockchain to potentially handle a significant amount of decentralized financial applications worldwide. The SDK is designed as the major marketing vehicle for OmiseGO, as the usability of the development tools and customization options of the wallet offer business a number of incentives to adopt the OmiseGO platform. This is a similar strategy to the one that Box used to build out their laundry list of enterprise customers. The first prototype iteration of the wallet SDK was released on Feb. 28 and is available via GitHub. Bitcoin-like) blockchain for fully on-chain cross-chain exchange. OmiseGO was designed for the Plasma architecture, which structures blockchain computation into MapReduce functions and uses a combination of proof-of-stake token bonding, fraud proofs to reduce the costs of computation, a withdrawal design to efficiently counter network attacks, and the network security provided by Ethereum as the root chain to safely enable unprecedented transaction and on-chain exchange processing speed and scale. The OmiseGO digital wallet SDK allows for integration with debit and credit cards for top-up and cash-out options, via ATMs or over-the-counter. These touchpoints effectively create a network of banking, hardware and retail partners where users can deposit/withdraw fiat currencies. When deposited, these currencies are tokenized on to a customer’s wallet applicator of choice and are immediately exchangeable for other tokenized currencies and assets via the OmiseGo blockchain. OmiseGO’s main focus has been the development and launch of the wallet SDK, and public release is slated for Q1, 2018. The other notable release is the OMG proof-of-stake public blockchain release in Q2, 2018. We hope to learn more about the staking details soon (i.e, how many coins to a run a node). Omise has kept the release dates for their other integral elements a bit of mystery, but more information should be available shortly. When you compare OmiseGO and its competitors, you find that they generally fall into two major categories. The first being centralized full-custody cryptocurrency exchanges, like Bittrex. These tend to be high performant, but they place trust in a single party, leaving security vulnerable. The second category includes blockchain networks like Ripple (XRP), which rely upon trading issued assets on their own platforms — Ether and Bitcoin cannot be traded without creating an issued gateway. The OMG chain is designed to operate trading across chains (e.g. ETH-BTC) without using full-custody issued assets for native cryptocurrencies. OmiseGO is being developed by a parent company, Omise. While Omise is a full-fledged business, they have promised to keep OmiseGO completely decentralized. Overall, the team looks to be capable to accomplish their development roadmap. The most notable member of the OmiseGO project is Ethereum creator, Vitalik Buterin, who is an acting advisor and outspoken advocate for the project. The OMG token is a proof-of-stake (PoS) token that enables stakers to receive rewards for running OmiseGO nodes. The underlying value of OMG is based on the amounts transacted on the OmiseGO network. This includes fiat and cryptocurrencies that are being pushed through the network’s decentralized exchange. OmiseGO has noted that use cases for their token will evolve with their network, and Vitalik has tweeted his approval of the OMG staking model. OmiseGO (OMG) currently has a market cap of ~$1.4 billion with a circulating supply of 102,042,552 OMG and a total supply of 140,245,398 OMG. It is interesting to note that OmiseGO was the first project to issue an Ethereum token via airdrop. OmiseGO is tackling one of the largest potential use cases for blockchain technology and has a well-defined development path. High-level execution by the Omise team will be essential to expanding OMG beyond its current valuation.